The Maryland Lease Termination Letter Form is a particularly useful letter template which satisfies GAM Article Real Property, Section 8-402 initial steps for ending a month-to-month residential lease. Whenever a landlord or a tenant wish to end such an arrangement, he or she must do so legally by issuing a notice of such intent, to be received, at least thirty days before the desired date for termination. This is a requirement set by the state of Maryland to aid the receiving party in absorbing the impact of seeking replacement for either a significant source of income or a residence. It should be noted that some counties may require more notice to be given so it is important to be up to date with the regulations of the ruling municipality. This form letter will address either party’s obligations. There will be a section available for a Landlord wishing to terminate the lease and a section available for Tenants obligated to issue this notice. The user should identity his or her role then fill out only the section that pertains to them. Then, it should be issued according to any instructions provided on the lease it concerns itself with. Step 1 – Check the box preceding the first paragraph. Step 2 – In the first paragraph, enter the calendar day, month, and year of the lease arrangement you wish to terminate in the first three blank spaces. 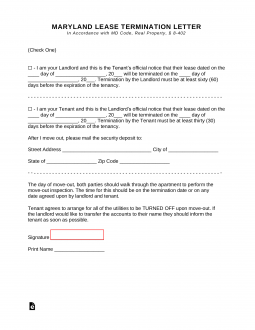 Step 3 – In the last three spaces of the first paragraph, enter the calendar day, month, and year you wish the termination to take place (this must be at least thirty days after the tenant has received this notice). Step 2 – In the first three blank spaces of the second paragraph, identify the lease being terminated by entering the day, month, and year of the lease date. Step 3 – In the last three spaces of the second paragraph, enter the day, month, and year you wish to terminate the lease. Step 4 – Just above the dotted line, enter the street address, city, state, and zip code where the landlord may mail you your security deposit. Step 5 – Sign and print your name at the bottom of the page.